The safe, fast and simple solution for removing micro-joints. 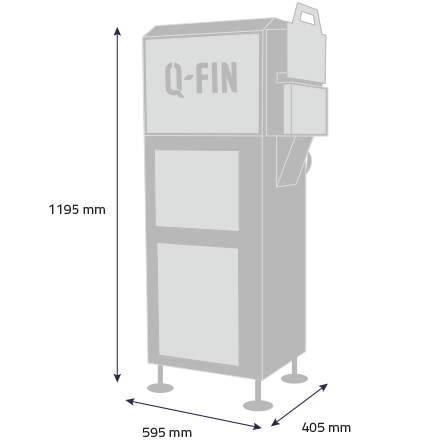 The Q-Fin SkipJoint is a compact machine with a rotating deburring disc with a diameter of Ø 255 mm. Thanks to the right-angled position of the grinding disc, you can remove microjoints safer, easier and more accurate than with a normal belt grinding machine or angle grinder. As simple as that. 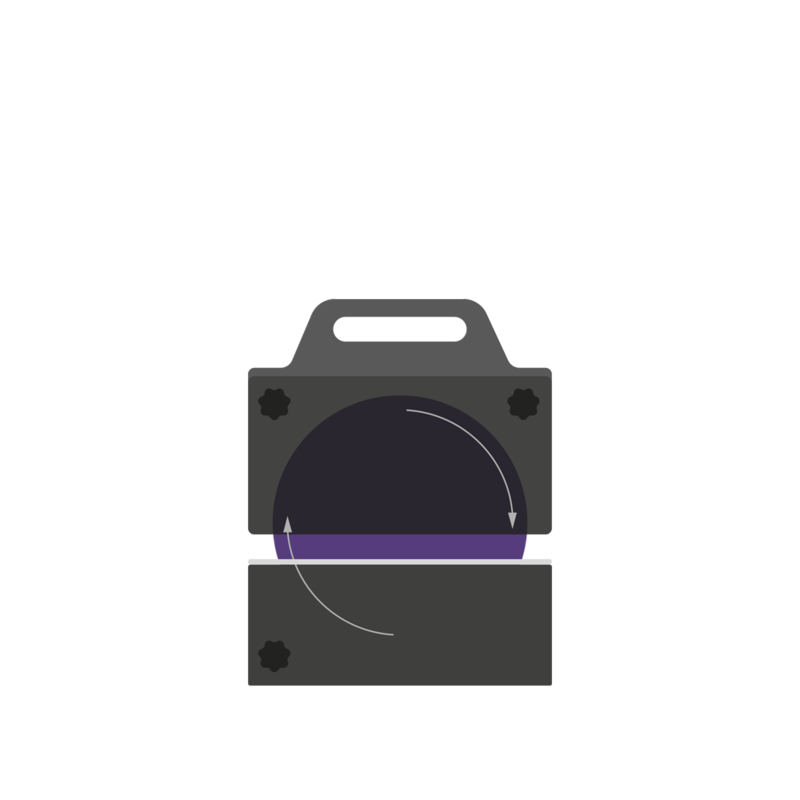 The SkipJoint features a flat synthetic bearing strip. With this, the micro joints are neatly removed perpendicular to the product. 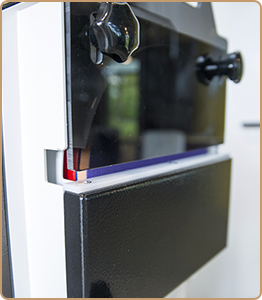 The polycarbonate guard plate can be set at the height corresponding to the product thickness. This way you are always working safely. Micro joints are an easy way to attach small components to sheets, by not cutting through a small part of the contour. However, after cutting, a small burr remains on the product. This small burr on the contour is often not desirable for a nice finish. But how do you remove these micro joints easily and quickly without undesirable changes to the contour of the product? 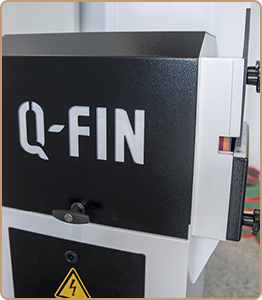 Q-Fin has a clever machine for this, the SkipJoint. 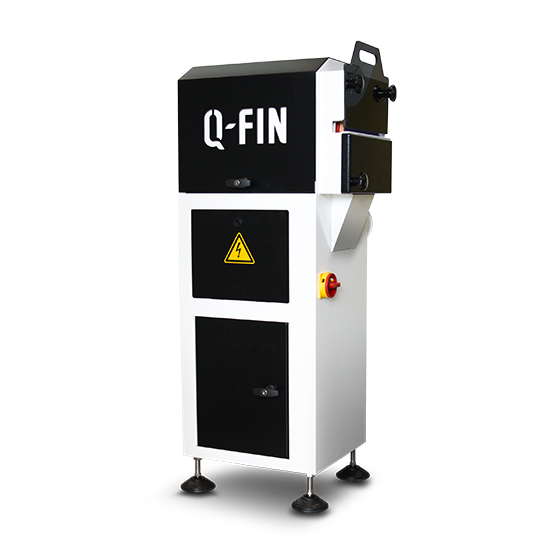 With this machine, you can remove the micro joints in a safe and quick manner with little effort. For the SkipJoint, grinding discs with various grain sizes and qualities are available, diameter 250 mm. You can easily change the disc once it is worn.